So, maybe you didn’t win the Scosche Headphones, and maybe you really, really want a pair of in-ear buds but you don’t have $30-$200 to drop right at the moment. Maybe you’re like me and cannot, possibly abide regular ear buds because of your tiny oddly shaped ears (TMI?) and they just don’t fit right, ever. 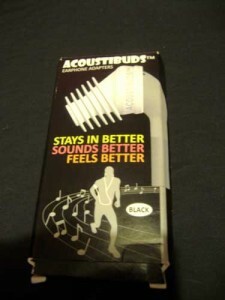 In any/all of these cases, I have great news for you, Acoustibuds exist! Small flexible silicone headphone adapters that fit over your current earbuds. Why this product is particularly great for the iPhone is that they also work on most Bluetooth handsfree headsets. It’s a pretty basic idea, really. 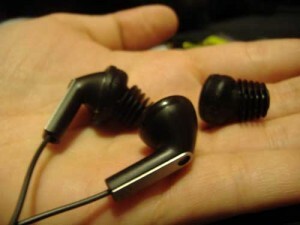 The Acoustibuds slide over the bud portion turning your headphones into in-ear, also known as in-canal, headphones. Not only does this help you hear the audio better (by simple directional amplification), but also makes them fit much, much better and stay in place. I understand that most people don’t have a problem with regular earbuds, and indeed designs have much improved in the past few years, but for someone like me who simply cannot keep normal ones in place – this is a great bargain. If these had existed back when I dished out my first $50 for Apple Brand in-ear buds I would have been much happier at the time. 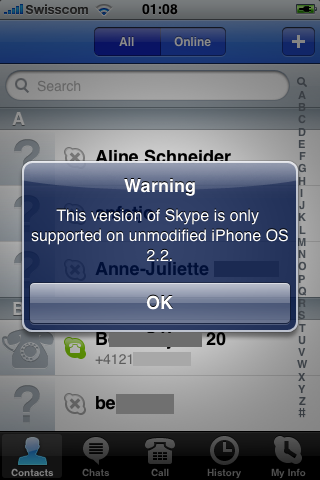 A few downsides, though. 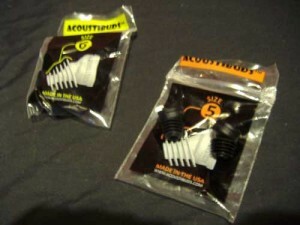 Firstly – you get only two pair, one of each size (5 Ribbed and 6 Ribbed) and I found even the size 5 to be too large. I was able to fit them, but they weren’t as comfortable as my regular in-ear ‘phones. I also want to explain that the sound quality, while amplified, is not clearer or heightened in any way. Just as with regular in-ear phones they do provide a bit more noise privacy though, so the guy next to you on the bus won’t judge you for listening to The Jonas Brothers, or whatever. The Acoustibuds website states that a smaller size is currently in development so some of the ladies out there like me, with little lady ears, might want to wait till those come onto the market. But for our Macho big-eared male counterparts, I highly suggest picking up a set in either Black or White, for about $15.00 USD. Or, win them for free, that’s always nice. You are all old pros at this by now. I have two sets (2 pairs per set) to give away. One set is white and one is black – so please let me know which you prefer. Comment below or tweet me. Winners will be announced Tuesday, April 21, because I will be out of town until then. Have a great week everyone! You might want to check out my Geek Blog at ChantelleJoy.com!